Definition at line 17 of file CModelParameterSet.h. Definition at line 15 of file CModelParameterSet.cpp. Definition at line 26 of file CModelParameterSet.cpp. References CModelParameterGroup::compile(), getModel(), mpModel, and setObjectParent(). Definition at line 46 of file CModelParameterSet.cpp. Assign the content of the source set to this, i.e., copy all contained parameters and groups. Definition at line 231 of file CModelParameterSet.cpp. Referenced by CCopasiXMLParser::ListOfModelParameterSetsElement::end(), CQParameterOverviewWidget::leave(), CQParameterOverviewWidget::slotBtnNew(), and CQParameterOverviewWidget::slotBtnSaveAs(). Definition at line 185 of file CModelParameterSet.cpp. References createFromModel(), CModelParameterGroup::diff(), CModelParameter::Identical, and mpModel. Referenced by CQParameterOverviewWidget::enterProtected(), CQParameterOverviewWidget::setFramework(), and CQParameterOverviewWidget::slotResolve(). Definition at line 75 of file CModelParameterSet.cpp. References CModelParameterGroup::add(), CModelEntity::ASSIGNMENT, CCopasiVector< T >::begin(), CModelParameterGroup::clear(), CModelParameter::Compartment, CModelParameterGroup::compile(), CCopasiVector< T >::end(), fatalError, CModelEntity::FIXED, CKeyFactory::get(), CModelParameter::getCN(), CCopasiObject::getCN(), CModel::getCompartments(), CModel::getInitialTime(), CModelEntity::getInitialValue(), CModelEntity::getInitialValueReference(), CCopasiRootContainer::getKeyFactory(), CModel::getMetabolites(), CModel::getModelValues(), CModel::getReactions(), CModelParameter::Group, CModelParameter::Model, CModelParameter::ModelValue, mpModel, CModelParameter::ParticleNumbers, CModelParameter::Reaction, CModelParameter::ReactionParameter, CModelParameter::setCN(), CModelParameter::setInitialExpression(), CModelParameter::setSimulationType(), CModelParameter::setValue(), and CModelParameter::Species. Referenced by CModel::applyActiveParameterSet(), compareWithModel(), CModel::compile(), and createParameterSetsForExperiment(). 159 // Check whether this refers to a global quantity. Retrieve the unique key of the set. Definition at line 52 of file CModelParameterSet.cpp. Referenced by CModel::applyActiveParameterSet(), CCopasiXMLParser::ModelParameterSetElement::end(), isActive(), CQBrowserPaneDM::load(), CCopasiXML::saveModel(), CQParameterOverviewWidget::slotBtnCopy(), CQParameterOverviewWidget::slotBtnNew(), and CQParameterOverviewWidget::slotBtnSaveAs(). Definition at line 68 of file CModelParameterSet.cpp. Referenced by CModelParameterSet(), CModelParameter::getModel(), CModelParameterSpecies::getName(), CQParameterOverviewWidget::slotBtnCopy(), CQParameterOverviewWidget::slotBtnDelete(), CQParameterOverviewWidget::slotBtnNew(), and CQParameterOverviewWidget::slotBtnSaveAs(). Definition at line 199 of file CModelParameterSet.cpp. Determine whether this is parameter set is currently active, i.e., it is synchronized with the model. Definition at line 221 of file CModelParameterSet.cpp. References getKey(), CModel::getModelParameterSet(), mKey, and mpModel. Referenced by CQParameterOverviewWidget::enterProtected(), CQParameterOverviewWidget::leave(), CQParameterOverviewWidget::setFramework(), and CModelParameter::setValue(). Definition at line 238 of file CModelParameterSet.cpp. References CNodeIteratorMode::After, CNodeIteratorMode::Before, CNodeContextIterator< Node, int >::end(), CModelParameter::getName(), CModelParameter::getType(), CModelParameter::getUnit(), CModelParameter::getValue(), CModelParameter::Group, CNodeContextIterator< Node, int >::level(), CNodeContextIterator< Node, int >::next(), CModelParameter::Set, and CNodeContextIterator< Node, int >::setProcessingModes(). Definition at line 58 of file CModelParameterSet.cpp. References CCopasiObject::getObjectAncestor(), mpModel, and CCopasiObject::setObjectParent(). Definition at line 205 of file CModelParameterSet.cpp. 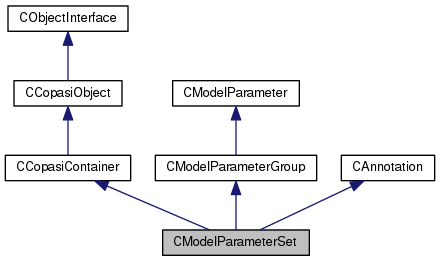 References CModelParameterGroup::compile(), mpModel, CModel::updateInitialValues(), and CModelParameterGroup::updateModel(). Referenced by CModel::applyActiveParameterSet(), CCopasiDataModel::commonAfterLoad(), CQParameterOverviewWidget::leave(), and CQParameterOverviewWidget::slotBtnNew(). Definition at line 121 of file CModelParameterSet.h. 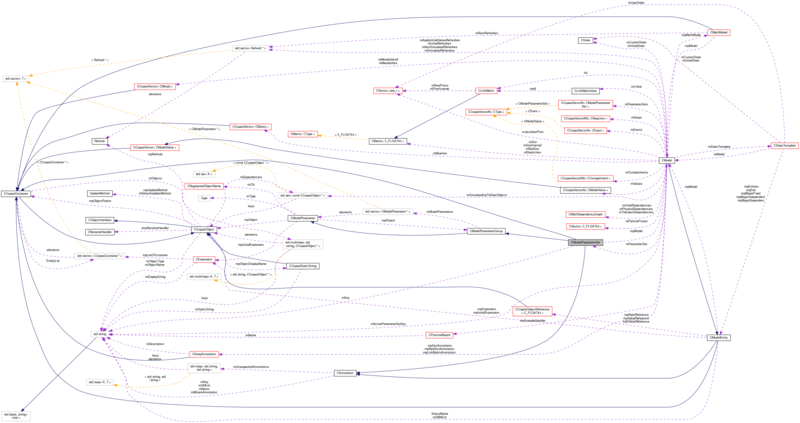 Referenced by getKey(), isActive(), and ~CModelParameterSet(). Definition at line 126 of file CModelParameterSet.h. Referenced by CModelParameterSet(), compareWithModel(), createFromModel(), getModel(), isActive(), setObjectParent(), and updateModel().